On Saturday, September 29, 2018, Dignity Health – Inland Empire will host the biennial “Gathering at Twilight” fundraising gala to benefit the emergency departments at Community Hospital of San Bernardino and St. Bernardine Medical Center. That evening the Foundation will honor the San Manuel Band of Mission Indians for their generosity to San Bernardino and surrounding communities and their recent $3.2M grant awarded to Dignity Health Foundation – Inland Empire in support Dignity Health’s commitment to making our community happy, healthy and whole. The Gathering at Twilight gala is the Foundation’s signature eventproviding an opportunity for the community to join together in celebration and support of both Community Hospital of San Bernardino and St. Bernardine Medical Center. The Caliente -themed affair will begin at 5:30 p.m. and be held in the Pavilion at the National Orange Show Events Center, located at 690 South Arrowhead Avenue in San Bernardino. Donors, friends and community partners will gather together in a concerted effort to honor San Manuel and raise funds for the hospitals’ emergency departments that will serve the Inland Empire. This most recent grant adds to the nearly $3.1M previously granted over the last 10 years from San Manuel Band of Mission Indians to the two hospitals. The longstanding partnership and support of San Manuel has allowed for the two hospitals to provide quality care to those most in need. Their current grant will help fund a new imaging center at St. Bernardine Medical Center and expansion of Community Hospital’s Children’s Subacute Center to serve young adults. Join Dignity Health Foundation – Inland Empire and San Manuel Band of Mission Indians for an evening of celebration. Tickets and sponsorships are available starting at are available for $175 per person and can be purchased by contacting the Dignity Health Foundation – Inland Empire at 909.881.4516 or online at www.SupportSanBernardino.org. Community Hospital of San Bernardino and St. Bernardine Medical Center are pleased to announce that the San Manuel Band of Mission Indians has provided a grant in support of Dignity Health's commitment to making our community healthy and whole. The grant of $3.2M to both hospitals will have a positive impact on the health needs of the community. 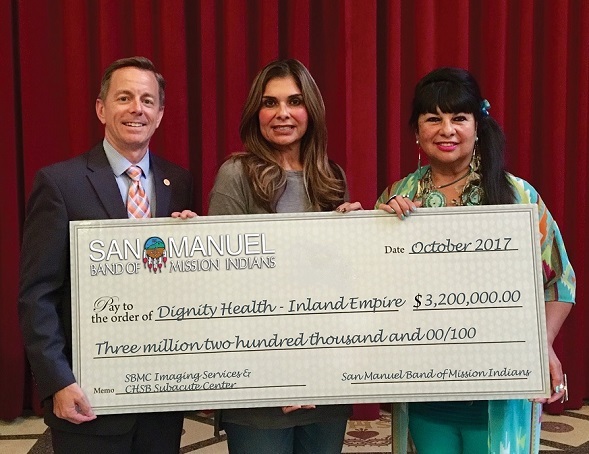 “The San Manuel Band of Mission Indians supports the mission of Dignity Health, Community Hospital of San Bernardino and St. Bernardine Medical Center to provide the highest level of care to all who need it without regard for their ability to pay. Our goal for this gift is to provide access to a healing environment to meet the health needs of the San Bernardino region,” said Lynn Valbuena, Chairwoman, San Manuel Band of Mission Indians. The funds granted to Community Hospital of San Bernardino will be help expand its Children’s Sub-Acute Center to include services for young adult patients. The Center, which is currently a pediatric only (ages newborn -21) sub-acute center will add 20 private rooms to serve patients ages 21-35. This most recent grant adds to the nearly $3.1M previously granted over the last 10 years by San Manuel Band of Mission Indians to the two hospitals. The longstanding partnership with the Tribe has allowed for the two hospitals to provide quality care to those most in need. More than the purchase of various capital equipment such as patient ventilators, state-of-the-art surgical equipment and the da Vinci Robotic System, this provides the community with vital healthcare services. Patients at each hospital are able to experience “Hello Humankindness” through quality healthcare services. 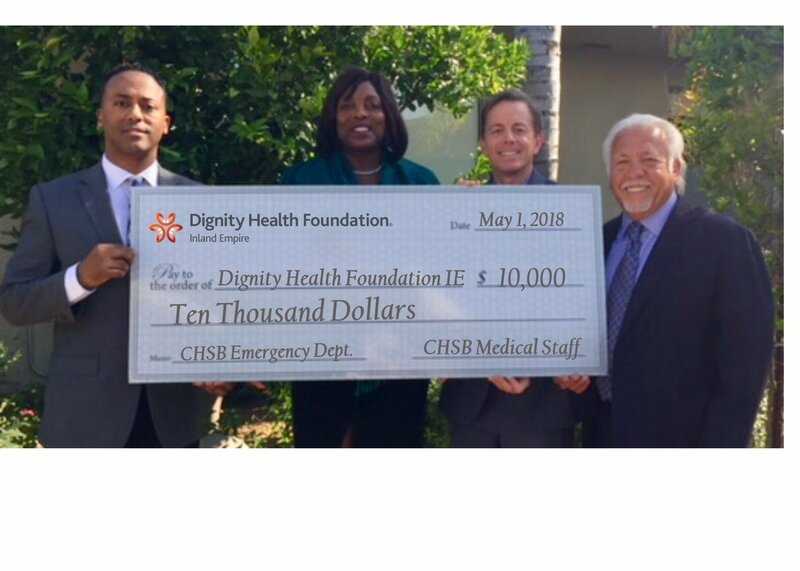 Thank you to the Community Hospital of San Bernardino Medical Staff who generously contributed $10,000 to the Dignity Health Foundation – Inland Empire this past spring to be used for the CHSB Emergency Department!